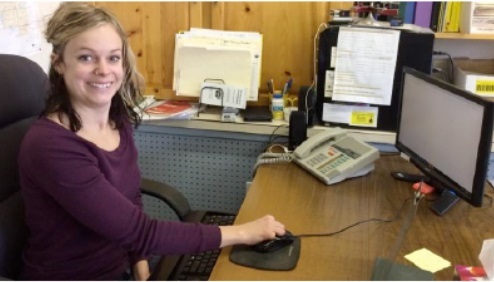 Previously trained as an auto parts technician, Stephanie was looking to re-enter the workforce. This time she was facing a few challenges; an accident has resulted in the loss of both her less, the loss of fingers and a brain injury. These barriers didn’t stop her from finding a job where she could make a difference. Stephanie is the social media editor at Sunnyside Realty Ltd. and Parsons Auctions – they’re glad to have help! Personal Genius: Stephanie enjoys the challenges, problem solving and working with technology. Employment: Employed since September 2017 at Sunnyside Realty. Some changes needed to be made in the office to create a more accessible workplace. Joint owners of Sunnyside Realty Ltd. and Parsons Auctions said they were happy to make the changes because it meant more help with getting the work done. Stephanie is gradually increasing her duties and hours as she learns the job. She has taken initiative to make suggestions and involve herself more in the operations of the company. Co-workers enjoy working with Stephanie and say she brings new life to the office. Since starting the job, Stephanie has also enjoyed more time out of the house, buying a puppy and starting to volunteer on the board of Blue Heron Support Services to provide input on continued services for persons with disabilities.